The Yukon NVMT Spartan Generation Two Night vision monocular features a Russian Gen 2 + Image Intensifier tube which gives impressive night time viewing making it the ultimate hand held night vision monocular for safari, wildlife observation and security applications. Three power magnification and a 50 mm high-aperture objective lens allow using the NVMT 3x50 for long-distance observation, more than a half of a kilometer. The objective lens has improved frequency and contrast features which delivers a crisp and contrast image with good resolution. The NVMT 3x50 (gen. 2+) is a passive device, it does not require any artificial light source, although a built-in or extra artificial infrared light will greatly enhance the scope's effectiveness especially at low level of night illumination (no Moon, starry sky or starry sky with partial cloudiness). The NVMT 3x50 employs an EMP66G2 image intensifier tube (gen. 2+) (total responsivity of the photocathode 400  550 µA/lm). The NVMT 3x50 (gen. 2+) features fine ergonomics, it is well-balanced, can be easily transported and is perfect for use in harsh field conditions. The NVMT 3x50 (gen. 2+) is entirely self-contained and can operate for up to 40 hours on a CR123A battery. The soft-touch coating of the body allows you to hold it even in the wet hands. 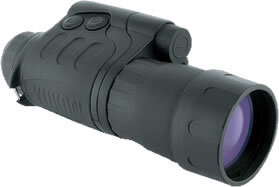 The NVMT 3x50 (gen. 2+) is ideal for hunting in night conditions, professional observation (guarding of industrial objects, nature preservation activities), amateur night photography, hiking etc.